In 2011, Project AWARE completely re-envisioned their organization–from mission, vision and programs to their brand and framework. Since then, the global nonprofit organization focused on ocean protection has shifted from a traditional organization-at-the-helm model to a more movement-oriented approach. They knew their greatest strength was their global network of nearly half a million scuba divers and ocean advocates (which has since grown to 1.5M), who fuel critical conservation initiatives and helped secure victories over the last two decades. 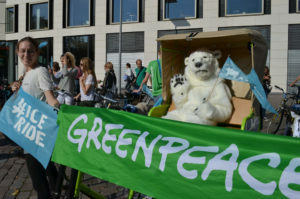 Moving forward, Project AWARE recognized that the key to influencing larger scale change would be to connect the dots among the supporters and empower them, placing their efforts at the centre of the movement. This shift was accompanied by a complete rework of the 20-year organization At the center of the program work was the build of a new web platform to connect global supporters to each other, to share local issues and ideas and to also publicly acknowledge their contributions. While Project AWARE had always hosted beach and ocean clean-up events, they launched a new initiative focused exclusively on engaging citizen scientists underwater, called Dive Against Debris. They not only urged divers to collect underwater trash they found, which remains out of sight to the larger public, but to record and report the quantity, type and location of the debris on the Project AWARE website. The organization uses that data to inform and bolster their policy and grassroots activism work. The backbone of Project AWARE’s marine debris work is the Dive Against Debris program. They recruit individual divers, community leaders and dive shop operators to join or host events, where divers collect and report on the debris they discover on the ocean floor and in the water column. Because they’re a global organization, a number of these resources are available in six languages. When the divers return to land, they and log the debris they’ve discovered and collected on Project AWARE’s site. Project AWARE’s latest weapon in the battle against ocean trash is the Dive Against Debris Map, which illustrates nearly three years of data their volunteer divers have collected since 2011. It enables users to get global view of the more than 400,000 pieces of debris removed and reported in over 1000 surveys. Map users can zoom and click through down to individual reports from across the globe. They can filter by different types of debris and date ranges. They can see images from the underwater reports and understand the impact our everyday trash has on fragile marine life. 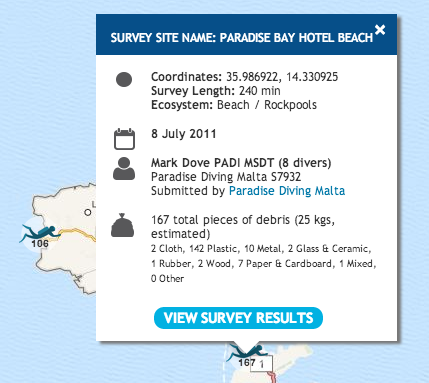 Users can zoom in on an area to get detailed dive reports like this one from the Paradise Hotel beach in Malta where divers recorded finding 167 items of debris during a 2011 dive. Just because you’ve built it, it doesn’t mean they will come. Implementing new technology is great, but relationships remain a top priority and connecting supporters with each other is still the key to success. People like to connect and act on issues they care about – especially with other like-minded people. Tying your online efforts to offline results is critical. People can easily feel overwhelmed by the scale of issues confronting the ocean. We want people to know that many small acts do make a difference–or, as we say, “one dive at a time”. It’s important to connect these supporters to each other online, let them share what they’re doing and provide them with tools to act locally. Also, visualize their impact so they feel like their actions–wherever they are in the world–are adding up to something bigger. Say thank you! We can’t say it enough but we also try to show it whenever, wherever we can. We highlight supporter action and shine a light on their efforts online and offline. We work alongside some pretty amazing volunteers and we know they appreciate being noticed. To put it simply, we wouldn’t make change without them. Thanks in part to projects like the Dive Against Debris Map, Project Aware’s list of scuba divers and ocean advocates has grown from 450,000 in 2011 to 1.5 million today. 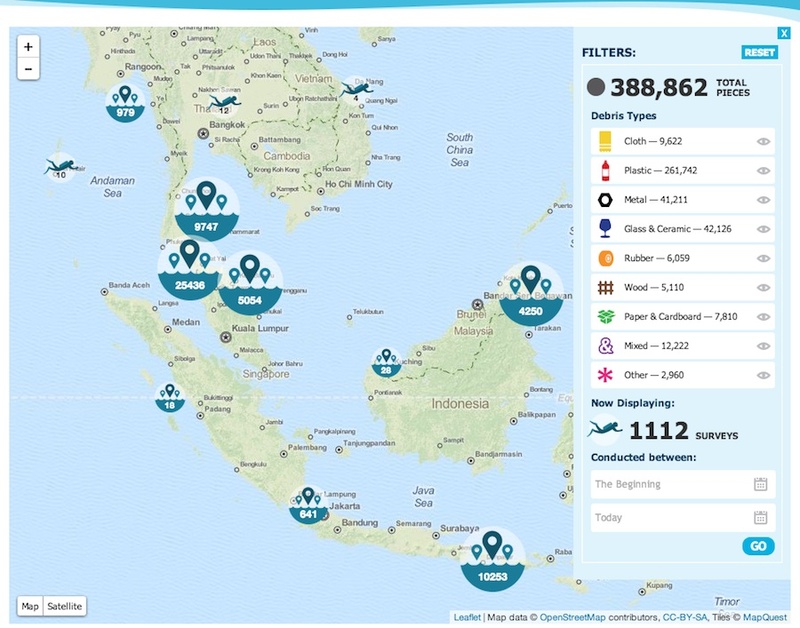 The map will visualize new debris reports submitted on an ongoing basis and Project AWARE will continue to explore new ways to share their unique underwater view into marine debris. This is a guest post by our colleague Darren Barefoot, co-founder of Capulet Communications and co-author of “Friends With Benefits: A Social Media Marketing Handbook”. 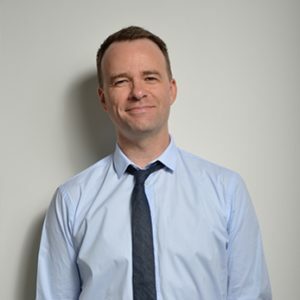 Darren worked with Project AWARE on marketing and communications strategy in 2011 and 2012. He is currently working on digital strategy at the United Nations Convention on Climate Change.